I think it is time to retire the old thread and start a new one (though feel free to combine if we want to wait till after the season). 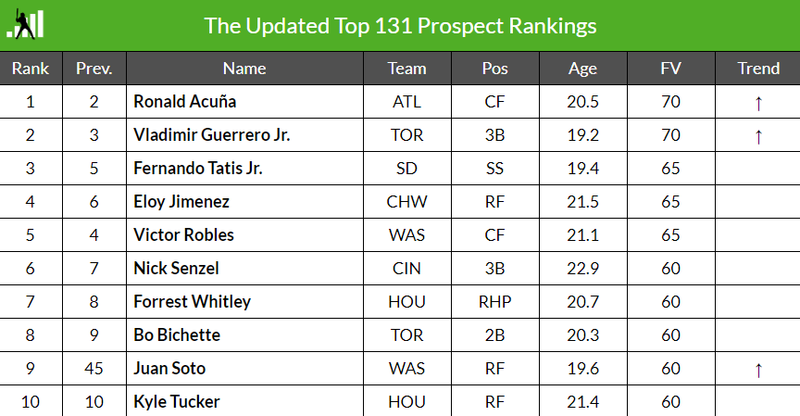 Fangraphs has updated their top 100 with a new top 131 (post-draft). Imagine Haseley or De Los Santos would be next on a longer list. Atlanta has 7 in the Top 50 and 13 of the 131. 6 of the Top 40 on BA’s updated Top 100 list as well, with Sixto the only Phillies prospect at #16. Better fire the money canon at Harper and/or Machado or we are likely to fall behind. Not a good sign that the only high first round pick that we can get on the list is the one that hasn't played yet. We have graduated a few players in the last two years, but there isn't much due to hit next year from that list. Yes, it's a serious problem. We haven't been drafting well enough and seem to have player development flaws. The Braves are well ahead of us on the farm and ahead of us at the major league level. It will take organizational improvements, a strong push, and some luck to surpass Atlanta. I think we drafted well this year, for the picks we had, but we were short on picks. We will have a very small international allocation this season. While I'm not about to defend the current regime's recent work even as the jury's out, it's hard to be surprised - and therefore also not disappointed - that things are not too bright for an organization that had its head in the sand until two years ago. Even the transitional year was run by Pat Gillick, and he didn't exactly do anything good for the Phillies' minor league system or long-term future when he was GM either. I hope there has been real change in both scouting and development over the past two years. At the top, maybe Almaraz is not the answer and maybe Jordan isn't either but at least they are not Wolever and Chuck Lamar. Most of what's been good at the upper level (and is not off the list) were either surprise guys or outside acquisitions. Certifiably amazing to me that a 22 year old in AAA with Enyel De Los Santos's numbers can't crack the Top 131 prospects in baseball. I know the scouts are all geniuses but at some point its what you actually do on the field that matters. Lack of Ortiz seems an oversight. And not even talking about Seranthony not really being a prospect. A slow start in a tough hitting environment coupled with an injury does not make him less of a prospect. Just returned from checking out his monthly splits. Ortiz is on fire in July with an OPS of .920. Henri Lartigue, C, Clearwater - 23 y.o., 6’0” Switch hitting catcher, has improved is plate discipline markedly (20 BB/339 ABs in 2017 at LWD, 23 BB/245 ABs thusfar in 2018 at CLW), and that has led to a .278/.352/.416 slash line. Don’t know what his defense is like, though. Carlos de la Cruz - I know I’ve said this a few times, but 6’8” 18 y.o. Putting up a slash line in about 80 ABs of .312/.389/.442 is something to dream on. Jose Pujols - 6’3” RF repeating CLW so who knows, but still only 22y.o. And improved from a .552 OPS in 2017 to an .838 OPS in 2018 thus far (335 ABS). Hope it’s for real, would really be good for the system depth. Jake Scheiner, 6’1” 22 y.o. 3B/LF, first full season. Improved plate discipline from last year at WPT, slashing at .288/.358/.453. If he can stick at 3B that would be prospect worthy, though he’s a bit older than optimal at LWD - don’t know what his defense is like though. I was watching the MLB channel last night and they mentioned that with the most recent trade the padres now have their whole top 10 list on the top 100 list...that's pretty amazing. To say I have strong disagreements with this would be an understatement. Quick reaction to this list...I'll go by their 1-10, their 11-20, their 11-30, and add a "missing in action"
*Bohm is too high for me, should be 4-5. SSS, but poor start in WPT and vague injury situation raise at least a smidgen of questions, don't they? *Moniak absolutely positively does NOT belong in the top 10. He's improved just a bit in the last month or so, but has a looong way to go. *On performance, Irvin belongs in top 10. Doesn't have top of rotation stuff, but has a high 4-5 starter probability for me. *I know it's SSS, but hitting .400 as a 17-year-old in GCL (with a $2.5 million bonus) makes my top 10 list. I see you, Luis Garcia. *Jose Gomez? No. He's done next to nothing since being traded here. *Will Stewart--hit 94 mph when I saw him in Lakewood. I'm sure I'm forgetting stuff but that's a start. Jose Gomez is the one glaring mistake to me. MLB.com has a bias to overrank prospects when they get traded in deadline deals - and then they have a second bias of their own previous rankings dictate future rankings. I might take a Maton over Gomez now for instance. And Jonathan Guzman as well. Probably Brayan Gonzalez also. Dohy seems an optimistic rank for a reliever, even one who seems likely to make the majors pretty quickly. In general it is not the worst list though. They clearly followed their draft bonuses to properly rank Pipkin. I was going to go with Gruillon next at 11. Grullon is an interesting omission here. Probably belongs somewhere on the list, though it may also be a sign that stats can be misleading. The added power may be as much due to Reading as anything else and the BB/K rates have not improved that much. Scouts still may not like how he projects or consider him as more than a backup catching prospect. Does not worry me though. He IS a future option in a year or two that might give us a better defensive option than Knapp. I also believe we have prospects in numbers in the low minors. Someone from Duran, Marchan, Aparicio, Gutierrez, and O'Hoppe is going to step forward and be pretty good in a couple of years.